Pomegranates are produced on large deciduous shrubs that can also be trained as a small patio tree. 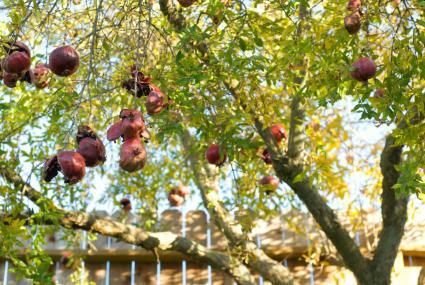 These trees are easy to maintain, ornamental, and fruit-bearing, making them a great addition to a landscape. Typically growing to a height of 10 or 12 feet, pomegranate trees have a dense growth habit with narrow leaves about 2 inches long that turn golden yellow in fall. Pomegranates are among the most ornamental fruit trees - the 2-inch tubular red flowers are very showy, as are the giant red fruits which persist until after the leaves fall from the tree. Compared to most fruit trees, pomegranates are low maintenance. If you can provide for their basic needs, you will be rewarded with a large, decorative harvest of juicy red fruit that keeps for two months or more in the house. Pomegranates are hardy in USDA zones 7 and up, meaning they can take winter temperatures as low as 0 degrees and will tolerate almost any amount of heat. In fact, they thrive on heat and have difficulty ripening fruit in areas with cool summers. They originate in hot, arid places, so they are naturally drought tolerant. 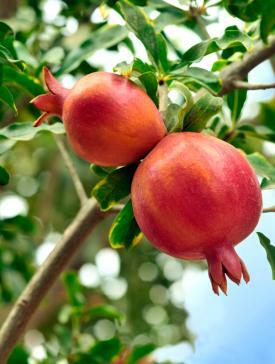 Perfect soil conditions are not necessary for growing a healthy, fruitful pomegranate tree. Any soil type is fine, as long as drainage is good. If you are growing them in a pot - which they are well adapted to - you will want to use a typical soilless potting mix for best results. 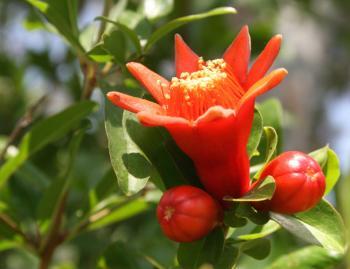 Eight hours of sun per day or more is needed to keep pomegranate trees in good health and to ripen the fruit. They make a charming specimen in a large patio planter or can be used as an edible hedge. If you live in an area that is borderline for pomegranate cultivation, try planting them against a south-facing wall to send a little extra warmth their way. If drainage is poor, build up a low, broad mound of soil at least 6 inches above the surrounding grade in the location where the tree is to be planted. Though they are adapted to arid conditions, it is important to irrigate pomegranates regularly in the first few growing seasons to get them established. In any week without a soaking rain, set up a small sprinkler around the base of the tree and leave it running for 20 to 30 minutes to give them a deep drench. Once established, irrigating is only necessary if there is not a soaking rain for 4 to 6 weeks. It's always a good idea to maintain a 3 to 4 inch layer of mulch over the roots for to conserve soil moisture and provide a slow release of organic matter to the soil, but otherwise, pomegranates are very carefree. Choose the tallest vertical sprout and tie it to a stake to keep it growing upwards. Remove any other branches that appear until the central stem is 4 or 5 feet tall. Once this occurs, clip off the top 12 inches of the stem while the tree is dormant in winter, but leave the stake for a couple more years until the trunk is thick enough to support the weight of the tree. Leave the branches that sprout from below the cut to form a canopy, but continue to remove any lower branches that appear. Fruit cracking open prematurely and rotting is the main problem associated with pomegranates, which is caused by an excess of moisture. There is no true cure, other than providing them with good drainage. 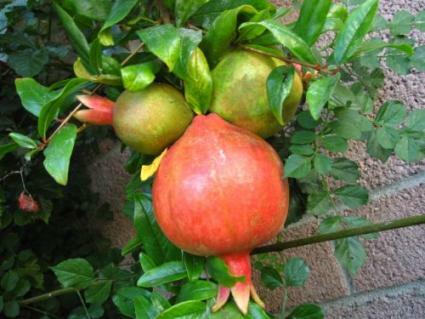 For this reason, growing pomegranates in cool, wet climates can be challenging. Wonderful is the standard pomegranate found in grocery stores and is known for its extra large fruit size. Eversweet lacks the intense sour flavor that some people find disagreeable in pomegranates and has clear, non-staining juice. Sharp Velvet has dark red flesh and is known for having a more refined, exotic flavor than other varieties. Nana is a dwarf variety growing only about 3 feet tall, making it just the right size for growing indoors. Pomegranates can be grown from cuttings at home, but are not typically propagated by seed. People often purchase trees that have been started and then replant them at home. Four Winds Growers is one of the largest and oldest growers of warm climate fruit trees in the country and offers an impressive selection of pomegranates - 13 varieties in total. Their trees come in pots 4 inches wide by 10 inches deep and are about $20 each plus shipping. Peaceful Valley Farm Supply offer six varieties for about the same price as Four Winds Growers. The company is one of the largest suppliers of organic gardening products in the country and they ship their pomegranate trees from September through March. 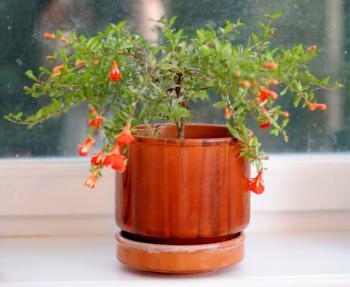 Gurney's is one of the few places online offering dwarf pomegranate bushes suitable for growing indoors. They are $15 each plus shipping and have received an average of 4.5 stars out of 5, based on 29 customer reviews. Pomegranates ripen approximately 6 months after flowering, which usually means sometime in the months of September or October, depending on the climate where they are planted. The best way to tell if they are ripe is to try one - the kernels inside should be plump and juicy. If in doubt, leave it on the tree, as pomegranates do not continue to ripen once picked. Pomegranates are a highly ornamental shrub, which is reason enough on its own to plant one. If your family enjoys the fruit, however, you will be rewarded with more than can be eaten in a season, leaving plenty to share with your friends and neighbors.